The hurricane of subsequent events make it seem history, a worry from another epoch, but just a couple of years ago Welfare Reform was the biggest issue in Northern Irish politics. The insoluble matter of dealing with the past (and its sister, dealing with the present) is the central tentpole in NI’s circus of problems but even it was in static equilibrium. Welfare Reform, however, was on a slow-moving and bitter journey. With hindsight, the 2011 to 2016 mandate looks like a festival of success for Stormont; this says more about the current shambles than it does about the first half of this decade. Welfare Reform was a flagship policy of the early days of David Cameron’s Conservative government, the baby of then Work and Pensions Secretary Iain Duncan Smith, who announced sweeping changes to social security at the 2010 Tory Party conference. Although social security is a devolved matter, in practice NI has had little choice but to mirror any changes made in Westminster due to the parity principle and its attendant financial consequences. Nonetheless, it failed to pass through the Assembly. After years of wrangling, the Welfare Reform Bill was sunk at the Final Stage, in March 2015, by a Petition of Concern. There were, however, some crucial differences in the roll out to Northern Ireland – in the form of mitigations. The extension of Universal Credit and PIP to Northern Ireland came with some agreed concessions. The bedroom tax, a source of major controversy in GB, was delayed by four years. The group had worked under the assumption there was £585m available and, remarkably, their report came in with an £84m underspend. It did, however, provide a roadmap for how Welfare Reform could be given a gentle landing in its implementation period (which we are living through now). Two recently-published reports have outlined various failures in the execution of these mitigations. Other NIAO observations included that one key strut of Welfare Reform – simplification of a complicated system – had backfired, with many stakeholders saying things are now more complex. Part of the mitigations package was a commitment to fund independent advisory services for potential claimants, but this money is only committed until March 2020 whereas the roll out is scheduled to carry on into 2023. A trio of NI organisations have produced their own joint paper looking at the impacts of Welfare Reform. 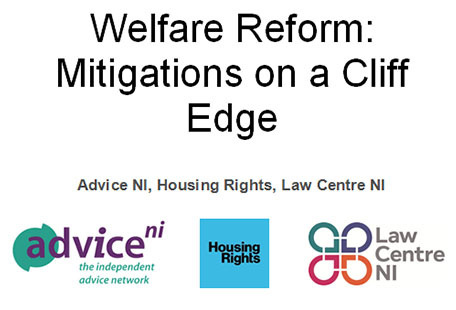 Advice NI, Housing Rights and Law Centre NI first published Welfare Reform: Mitigations on a Cliff Edge in November, while an amended version following in December. Option 1: Discontinue the mitigation package This option will give rise to considerable financial hardship. As outlined in section 1.4, the end of the mitigations scheme will result in significant financial loss for many claimants and is likely to result in increased poverty for both adults and children in Northern Ireland. Option 2: Continue the mitigation package in its current form This option will be helpful insomuch as it will continue to protect claimants from some of the existing measures; however, it will not protect claimants from the evolving landscape – specifically, the hardships arising from Universal Credit. Nor do the current mitigations offer help with housing costs to claimants living outside of social housing despite successive benefit changes which make it more difficult for them to stay in their homes. Option 3 is our preferred approach. The continuance of and re-profiling of the mitigations package is consistent with the direction of travel set by the NI Executive prior to its collapse, including the commitment to ensuring protection for social security entitlement in Northern Ireland. The underspend – which has occurred for many reasons – is unfortunate but the idea here that the mitigation package can evolve and that the money earmarked but unspent could give such an evolution some teeth is a good one and the figures are considerable. In 2016/17, £65m was set aside and only £20m was spent, and in 2017/18 these figures were £149m and £58m. The organisations’ report outlines the underspend in more detail (as does the NIAO paper) – and also explores each of the three options for mitigations in future. They believe that discontinuing mitigations could be open to certain legal challenges and, regardless, is an unacceptable choice that would increase hardship felt by an increasing number of vulnerable people. The second option is considered better than the first but, being less flexible and ultimately less insightful than a reworked allocation, it is the third option the organisations would like to see. A move such as that, however, requires political leadership – and ministerial approval. Before Brexit, and RHI, and perhaps changes in the leadership of the DUP and Sinn Fein (Arlene Foster took over as DUP leader and First Minister between the signing of Fresh Start and the publication of the Evason Report), Northern Ireland had a whole raft of problems that remain unfixed. In many cases, such as with Welfare Reform, they are only getting worse. Without a functioning Assembly, solutions are hard to imagine.